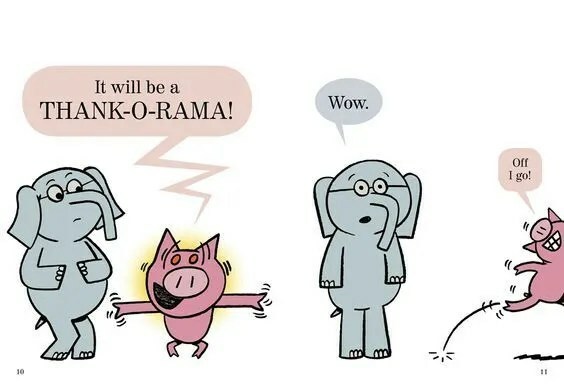 The final book in the elephant and piggie series. Say it isn’t so. It brings a tear to my eye. I have been bringing these books home from the library as long as I can remember. Kylie and I have always read them together. The first Mo Willems book I brought home was Don’t Let The Pigeon Drive The Bus. I am thinking it was around when Kylie was two. The book had already been out a few years. I would use different voices for the different characters. Mo Willems’ books helped Kylie learn to read. We always had fun trying to find the pigeon on the back page. After we read all the pigeon books we moved on to the elephant and piggie books. Today I Will Fly and There Is A Bird On Your Head always made Kylie laugh. The older she got and the more she could read, she started playing the part of piggie and reading those parts. I, of course, was left with elephant. I would bring them home periodically, when I would remember to search the library for new books by Mo Willems. It seems like it has been awhile but maybe it has not, as time seems to fly nowadays. Anyway, I was doing a search and Thank You appeared. Yeah, a new book. I wish I could’ve had a camera ready when I brought the book home. Now that she is 10 3/4 and starting middle school in just a few months I did not expect her reaction. Her face lit up and she got a big smile on her face. ” A new one, yeah,” she said. We dropped everything and read our parts together, like we have for the last eight years. 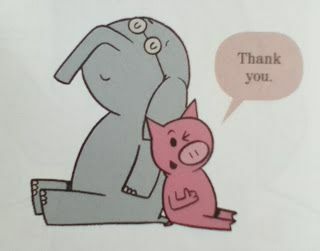 In closing, thank you Mo Willems. For giving my daughter and me eight years of memories. Memories I am sure she will continue with her children when she has them, hopefully a long, long, long, long time from now. 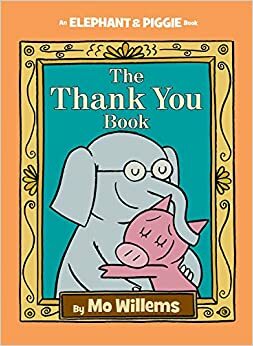 For now, I will cherish her face lighting up as she saw Thank You and I will cherish all the memories, stories, and everything elephant and piggie has taught her as she grew up. The laughs we shared, the words we learned to read and, most importantly, the time we were able to spend together.